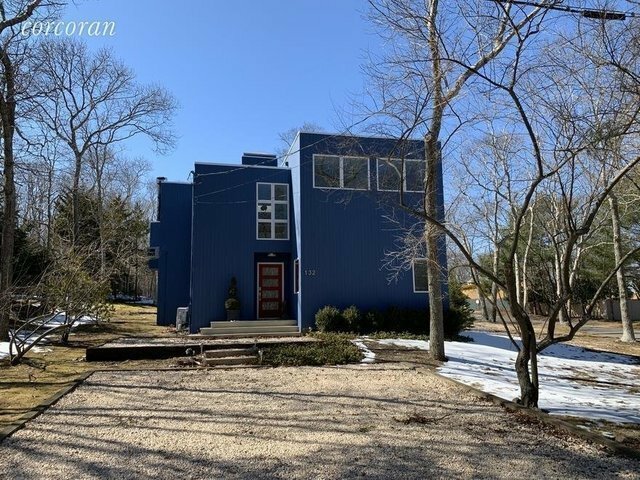 Rental Registration #: 18-537 Located in the Lion Head Beach community of Springs, in East Hampton, this recently renovated modern 3 bedroom, 2 Â1/2 bath is a perfect summer rental. The house has new white washed floors, is freshly painted and all new furniture. The bedrooms, which include new custom closets and SmartTVs, are located on the first floor offering peace and tranquility. The natural light filled second floor offers a sunny open concept living space including living room, kitchen and dining room. The living room provides a warm and relaxing environment with brand new 65" Ultra HD/4K Smart TV. The kitchen provides a huge island (perfect for entertaining), stainless steel appliances, stone floor and back-splash. The dining area offers a live-edge dining table with seating for ten, a wood burning fireplace, and a wall of glass French doors. This brightly lit modern home with its beautiful multi-level wood deck and pool is the perfect venue for entertaining. New outdoor teak furniture, BBQ and beverage cooler compliment the large heated pool on a fenced in half-acre lot with a detached 2-car garage. A short stroll to the beautiful private Lion Head Bay Beach and Marina. Should you wish to leave this peaceful oasis, you are just 6 miles from East Hampton Village shopping and restaurants. Folio# 48322..